PokerNewsBoy have teamed up with BetOnlinePoker.org to offer PNB poker players an exclusive 200% sign up bonus for new depositors. The easiest way to make sure you receive the 200% deposit bonus at BetOnline Poker is to sign up using this LINK. This will take you to our exclusive BetOnline Poker Bonus page where you can see BetOnline Poker Promo Code: TTOPS. If you use this link to sign up at BetOnline Poker, and once you have signed up at BetOnline Poker and deposited all you have to do is email: freeplay@betonline.ag using the BetOnline Promo Code: TTOPS as the subject line. You will then have your 200% bonus added to your account. The advantages of playing online poker are simple: there’s no dress code, players can logon and play no matter where they are in the world, there’s always a table full of players to join and the rate of play is much faster than live games. Perhaps the greatest advantage of online play, however, is the incentives and promotions offered by sites to entice new players to sign up, and old ones to stick around. The BetOnline poker promotions are some of most lucrative available, making its online poker room a favorite for players of all abilities and bankrolls. One of the biggest complaints that online players have is about large-scale tournaments not paying out. These huge competitions can drain hours of time and give no reward, frustrating players deeply. However, on BetOnline, there is over $150K in Guaranteed Tournaments to combat this frustration. All of this large sum will be used up in a month’s time, so players will do well to sign up soon. Buy-ins to these Guaranteed Tournaments can be paid in real money or in promo bucks, and the amount required to enter will depend on the individual tournament. Make sure to read up to date BetOnline Poker Reviews for most accurate information. In conjunction with the $150K in Guaranteed Tournaments promotion, BetOnline is also offering a tournament bonus on all deposits in promo bucks which can be used to enter tournaments. Every $50 deposit made will come with 200 promo bucks (though they must be requested), and players are allowed up to 4,000 promotional bucks through the promotion. Many lucky individuals have turned their free promo bucks into cold, hard cash through tournament play, and there’s no better time than now to join their ranks. 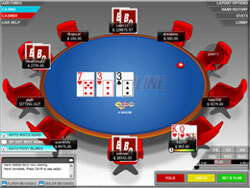 BetOnline Poker also rewards their valued players with frequent Hit &Run freerolls. These free tournaments require no real money or promo bucks to enter, yet pay out in real cash! Players have been able to establish themselves financially on the site simply by winning these tournaments. The prize pool is paid for by the site itself – freerolls are another way in which BetOnline says “thank you” to its players. Whether players are making a living or just having some fun online, they will do well to keep an eye on the promotional offers. BetOnline’s $150K Guaranteed Tournaments, 25% deposit bonuses and frequent freerolls make it one of the most player-friendly sites on the web. With these great deals featured currently, there is no better time than now to start having some fun at their tables!